4000-Footer Club T-Shirt - gray New design and color for official shirt of the AMC Four Thousand Footer Club. 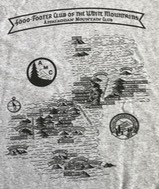 Light gray, 100% cotton, has replica of 4000-Footer Club patch on front and illustration of the 4000-foot peaks on back, reproduced from the 4000-Footer Club awards scroll. $5 of purchase price goes to club trail maintenance fund. Men's sizes S, M, L, XL, 2XL and Youth Large (equivalent to Women's Small). NOTE: Not eligible for Media Mail shipping rate. Ships via First Class Mail or Priority Mail.